Reader Question: I'm looking for some suggestions and thought maybe you or your blog might be a good place to start. My mom really wants to subscribe to a bridal magazine for me, but I don't want to get sucked into the Wedding Industrial Complex. Do you know of any magazines that are more along your lines of what a wedding should be like? Perhaps some other readers would have some suggestions as well of what magazines they do and don't like. I wish! I really do. Maybe someone out there will know of something? All I can say is: Tell her you want books instead! You're right to worry that reading too many wedding magazines can cause you to see the world through the lens of the Wedding Industrial Complex. Magazines are chock-full of advertisements that try to convince you that you absolutely have to spend more money in order to have the once-in-a-lifetime wedding you always dreamed of. And not only do you "have" to spend that money, you should want to! Even the magazines that feature interesting weddings (like Martha Stewart Weddings) seem to overemphasize the "pretty details" of a wedding. The truth is, most of our guests don't gush over such details. They notice much bigger-picture things. When we look at too many pictures of pretty details (either in magazines or on blogs or on TV, etc. ), it can become easy to get obsessed with recreating them at our own weddings or feeling guilty if we don't have the time/money/desire to do so. I'd say skip over the magazines and head for the bookstore. Ariel's book, Offbeat Bride, is full of lots of awesome examples of weddings, as well as solid, how-to advice. I'd also recommend One Perfect Day: The Selling of the American Wedding if you want an in-depth analysis of the Wedding Industrial Complex. Although I haven't read it, I've heard that The Conscious Bride does a good job of exploring the deeper, emotional issues surrounding weddings. 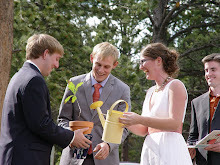 I also found The DIY Wedding to be super-helpful in my own planning. Or how about some books about relationships, since our weddings last approximately one weekend and our marriages should last the rest of our lives? I recommend the Five Love Languages (even though it's super-cheesy) or Getting the Love You Want couples workbook, for starters. As for your original question, I'm eager to see if other kindred spirits do have some good magazine recommendations! I'm siding with Sara on this one, go for the books and skip the magazines. In our entire engagement, I purchased 3 magazines and made a vow not to read them obsessively, only as a source of inspiration. Wedding books on the other hand, I have in spades. Offbeat bride is a must as is The DIY Wedding, like Sara said. Even magazines like Real Simple Weddings turned out to be... well, not so simple. Even though it was slightly less WIC-y than some, it still caused me to get sucked into the whole "we have to have this for our wedding because the magazine says so" with its focus on the details and inclusion of those moronic "you have to have all of these things done a year, 6 months, 3 months, 2 days before your wedding" checklists that drove me nuts. the follow-up to Eat, Pray, Love (never read it, but part 2 is great!) 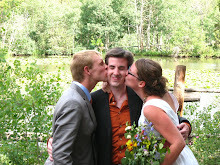 Committed: A Skeptic Makes Peace With Marriage. I'm happy to be the cheese that stands alone here. I found Real Simple to be pretty helpful. Full disclosure: I consider myself to be more materialistic than much of Sara's readership, but at the same time wholly conscientious of my choices. It isn't realistic for me to have Sara's wedding (although I adored it, and am thus a faithful reader because of it). Because I will be doing "traditional" things like catering, getting flowers, etc., I needed tangible inspiration and guidance. While I take all of the planning with a grain (heap?) of salt, Real Simple seemed to be the least scary of the magazines. Plus, it's not a subscription as I can tell, but an annual publication. I got mine half off from a local bookstore with a coupon and it came with a 1-year subscription to Real Simple (the regular periodical). I'll also ring in with huge support of the Offbeat Bride brand. Collectively,the book, website and Offbeat Bride Tribe social network have hands-down been the biggest source of support and inspiration to me. I bought a couple magazines (Martha Stewart, Real Simple Weddings) but just tore out the pages I liked and chucked the rest. I even started going the book route, and bought a wedding planner and Off-Beat Bride, but then I realized, I don't want a wedding where I need a book to tell me what to do. Or to be planning something so elaborate I can't just keep track of it in some Google documents, so those books got returned. With the help of good wedding and craft websites, I've been just fine without the books or magazines. If you think you can ignore the WIC, set up a wedding registry on amazon, and you'll get a subscription to BRIDES magazine for free. I just flipped through to look at pictures and get inspiration. There are a lot of ads to skip through, but free is free. Aside from ignoring the typical things they tell you a wedding should be, some of them were even quite amusing. My fiance and I got a good laugh out of the lengths that some people go to for one day. On another free note, I borrowed books from the local library on wedding planning for inspiration. I didn't want to buy a book I was only going to use for a short time and never look at again. Great advice. One Perfect Day is the first thing I read after deciding to get married and it lays a solid foundation of sanity. 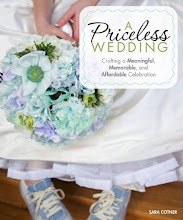 Following up on what Heather suggested about using the library, if your library selection blows, I suggest you get your own copies of the books but donate them to a friend/relative planning a wedding after you are done. If you don't know any in real life, donate them through the internet! My favorite book I've read so far is, hands down, _I Do, But I Don't: Walking Down the Aisle Without Losing Your Mind_ by Kamy Wicoff. It is excellent. Personally, I wasn't a fan of the Offbeat Bride. I'm only mentioning this to say that if you happen to not like what she's doing there, know that there are still other options which successfully avoid the WIC. SKIP the magazines -- if you *really* want glossy, pretty inspirational photos (and I urge you to limit your intake, because they will drive you crazy), everything's online and more current than any magazine. I second the recommendation for all the books Sara mentioned. Seconded on "I do but I don't" the best book I read while planning my wedding. I bought a copy for my mother, made my fiance read it, and just bought another copy for another friend who's getting married. It really slices through the sense that we're being pulled in two directions as modern women having a wedding. On one hand we're practical and have a good head on our shoulders and know that certain things SHOULDN'T matter, but on the other hand we're still susceptible to the pressures of becoming the "ideal woman" around our wedding day, and the juxtaposition can make you crazy. Kamy Wicoff got me back to some sort of sanity. For inspiration if you DO like pretty details, I recommend Martha, and I recommend that before you sit down and look at the idea you sit down and rip out all the double-sided ad pages and do your best to ignore the ones with useful information on the other side. Also a good sanity-helper. For my wedding I'm not really referring to any books or magazines. I might look at a few books just to see what they offer. Chances are I'm going to stick with my own ideas. Now I love Martha Stewart. I own two of her books. They are laid out so nicely with great pictures. I'm a fan of Martha because she's creative like me. So for my wedding if I do decide to look at books for ideas I might use my two Martha Stewart Books that I already own. Cost: Free! I bought her latest sewing book because I though I could get inspiration for my wedding. I also receive emails from Martha Stewart about creative wedding ideas as well. I do go online and search for ideas too. I try not get myself so caught up in the wedding industry. That is why I'm always visiting the 2000 Dollar Wedding website! When I was in the grocery store one day I picked up a wedding magazine. I was overwhelmed with the amount of stuff I saw in this magazine. I would never spend thousands of dollars on a wedding that didn't represent my fiance and I. To me getting married is about preparing for my marriage more so than my wedding. So I've opted not to look at those magazines. I want a stressful wedding not one full of stress! Thanks for posting my question Sarah! I've got One Perfect Day coming to me from the library today! Can't wait to start reading. I'll have to buy I do, but I don't (probably used from online), but it's on my list too! 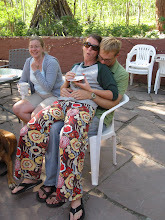 Nerdlove - I love the idea of having your mom read it. I really might send it to mine after I've read it. I want her to understand where my decisions are coming from. I feel like I need to have a "recommended reading" list on my invitations, haha!